-With uninterrupted shooting with the SB-900 set to i-TTL mode, images captured just before the flash ceased firing were sometimes slightly overexposed. This issue has now been resolved. By resolving this issue, metering precision has been further increased and the number of times the flash fires has also been increased. -When the SB-900 (set to TTL auto flash mode) is used with a camera supporting the Nikon Creative Lighting System (CLS), flash mode automatically changes to A mode according to camera communication status. That flash mode was previously maintained, but it has now been modified so that TTL auto flash mode is restored once the SB-900 again recognizes the camera as a CLS-compatible camera. When installing the new firmware for the Nikon SB-900 on the Nikon D3 and D300 DSLR’s be sure to have updated firmware on the camera. That is not necessary for Nikon D90 and D700. Download the Nikon SB-900 flash firmware version 5.02 here for Windows and here for Mac. 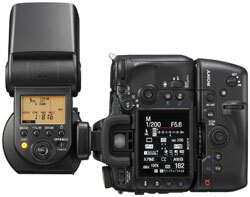 Sony has announced a new flagship flash unit, the Sony HVL-F58AM, that will be released in June, 2008. The Sony HVL-F58AM flash unit got a new Quick Shift Bounce system. The flash is able to move 90 degrees left and right on a horizontal axis in addition to the usual up and down movement. The HVL-F58AM flash unit is compatible with all current DSLR camera from Sony and will also be compatible with the new fullframe DSLR camera that Sony will release later this year. The HVL-F58AM flash unit will ship in September for about $500 at sonystyle.com, Sony Style® retail stores (www.sonystyle.com/retail), military base exchanges, and authorized dealers nationwide. Pre-orders begin online on Jun. 20 at www.sonystyle.com.